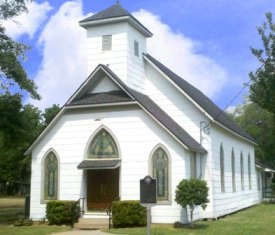 Wallis United Methodist Church, the small church with a big heart, welcomes all who visit with open arms and smiles. We're known as a friendly place to worship God and grow your faith. Our dress code is casual, the atmosphere is warm, and we know that if we were perfect, we wouldn't need to be here! Put simply, there are "no perfect people allowed!" Visit us on Sunday morning. Gathering begin at 9:30 am, worship is at 10:00 am. There are always snacks, pastries and fellowship following worship. On the first Sunday of each month, we offer Holy Communion to all believers, and invite everyone to stick around after church for our Fellowship Lunch. We're just 12 miles south of Sealy, across the railroad tracks and next door to Wallis City Hall. You're always welcome, so come as you are to a church that can help you through the CROSSroads of life!